Get more done with intelligent meeting room solutions. A unified system lets users see room availability and reserve on location or online—including integration with your existing scheduling system—and define the perfect environmental setup in advance. Lighting, shades, AV equipment, and more can be customized when the room is reserved so you and your team can get to work right away. Prepare meeting rooms in advance with Crestron Fusion, so they’re comfortable and ready at the scheduled time. 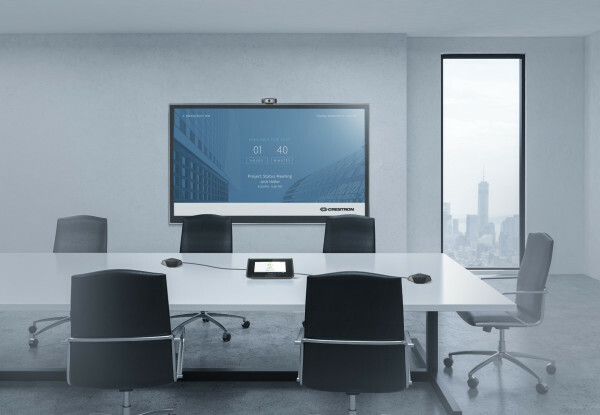 If the meeting is cancelled, there’s no need to tell the room—when no activity is detected after the timeout period, Crestron automatically returns the room to a low-energy state by turning off lights, lowering HVAC, and adjusting other equipment. You can develop additional custom automations triggered by time of day, light sensors, or motion sensors. Shades close at mid-day, doors lock at specified times and equipment turns off when it is not being used.